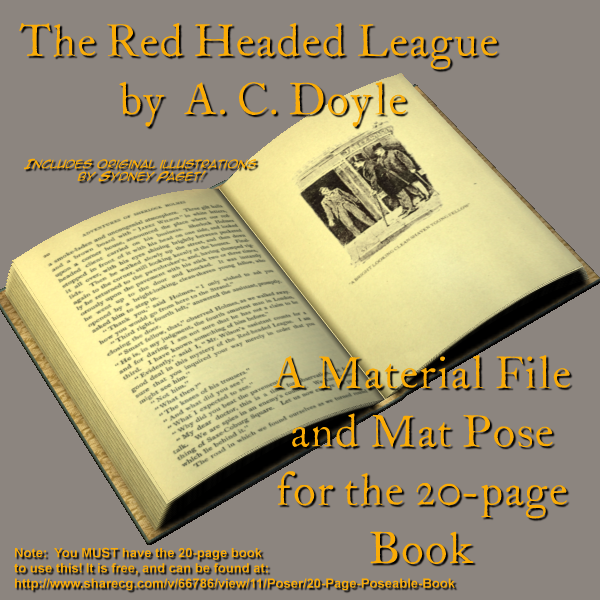 This is a mat pose and material setting for my 20-page book that turns it into a vintage copy of "The Red Headed League" by Arthur Conan Doyle. It includes corrected animation poses (the original download had the animation poses saved out incorrectly), and the book itself includes original artwork by Sydney Paget. After you've arranged the files where you want them, open Poser. Load the book, then select it, load the pose and away you go. great addon for the book! loved the story ^^ - and anyways, it gives such a lovely vintage look :) thank you! TheGreyOne (5 years ago) Inappropriate? Wow! I LOVE this. Thank you. Eustace Scrubb (6 years ago) Inappropriate? Any chance of getting one of Doyle's G. E. Challenger books into it? Another great texture, THANK YOU Jim Farris. Thanks so much for this fantastic add-on! Jim, you've probably seen my short animation I did with your book. Tedious work to animate the pages. I can now inform you the update works fine in DAZ. 40frames animation worked in a second. Thanks. Poe's works are a good idea, I'll have to poke around and see what I have (or can get). I would like to see some of Poes works. The Raven and The Telltale Heart should both fit in one copy. Don't know about copyrights but some must be useful. Rated both downloads. Thanks again. Want to see other books? Use the comment block here to make suggestions! Want you have your suggestions taken seriously? Keep your sugestions down to short works in the public domain that will actually fit on 20 physical pages (40 print pages), and remember to rate the original 20-page book!